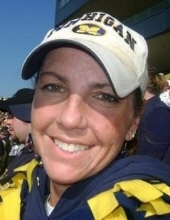 POCCI, Julia K.- Age 42 of Brighton, passed away Sunday, April 7, 2019. Funeral Services will be held 12PM Friday April 12, 2019 at Sharp Funeral Homes, Fenton Chapel, 1000 Silver Lake Road, Fenton. Pastor Phil Goward officiating. Visitation will be 10 AM until the time of service. Interment at Great Lakes National Cemetery 4200 Belford Rd., Holly. Memorial contributions may be offered to the family c/o Sharp Funeral Homes. Julia was born May 27, 1976 in Alpena, the daughter of Marcus and Catherine (Senchuk) Mende. She was employed for many years as an RN at University of Michigan Hospital. Julia proudly served in the US Navy. Surviving are: son, Tyler A. Pocci; mother, Catherine Senchuk, brother, James (Niki) Mende; step mother, Evelyn Mende; siblings, Melissa Mende, Marcus Mende, Elizabeth Mende, and Michael Mende; nieces and nephew, Payton, Logan, Josalyn, and Isabella. Julia was preceded in death by her father Marcus Mende in 2011. Online tributes may be shared at www.sharpfuneralhomes.com. To send flowers or a remembrance gift to the family of Julia K. Pocci, please visit our Tribute Store. "Email Address" would like to share the life celebration of Julia K. Pocci. Click on the "link" to go to share a favorite memory or leave a condolence message for the family.